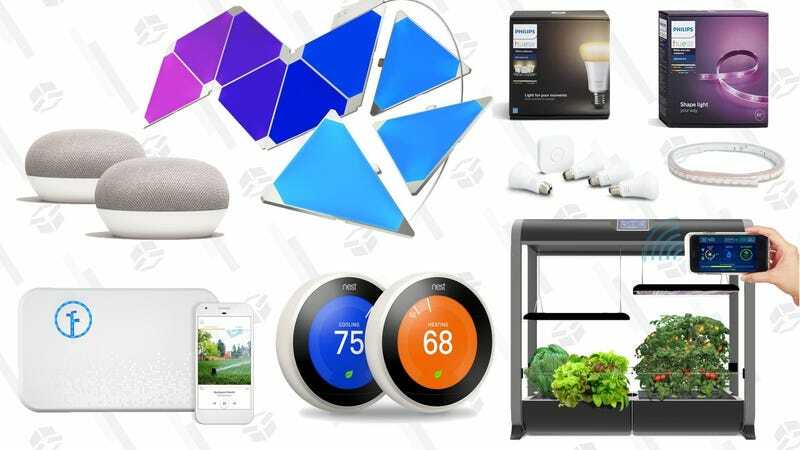 If you somehow didn’t get all the smart home gear you wanted during Deals Week, Home Depot’s giving you a second chance with a wide-ranging, one-day sale. The highlight in my mind is Nanoleaf’s Aurora smart lighting kit for $160, an all-time low. Are the wall-mounted RGB triangles practical? Not really, but damn they look cool. For a more “normal” (but still fun) lighting setup, grab a four bulb Philips Hue white ambiance starter kit paired with a Hue Lightstrip for just $168. Even on Black Friday, that would have cost you $180 on Amazon, and they’d be well over $200 now. Some of the other best deals are limited to two-packs: Two Google Home Minis for $50, and two Nest Thermostats for $338. Beyond those, you’ll find deals on irrigation controllers, smart indoor planters, smart locks, and more. Just remember that the sale ends today, so be as smart as your future home, and check it out.